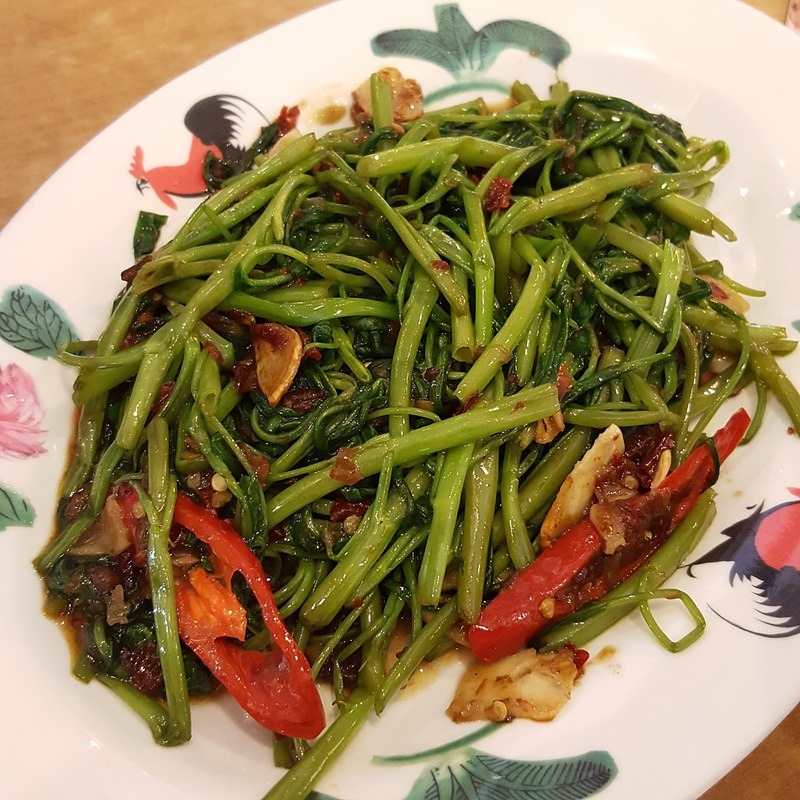 Teck Sing Restaurant 德星茶餐室 is a well known Chinese restaurant offering delicious food at affordable prices. 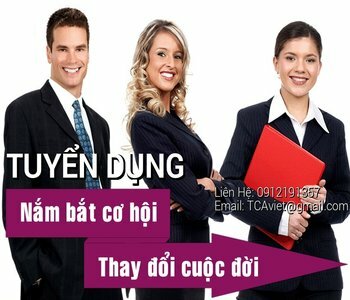 It has several signature dishes, it's most famous signature dish is the Teck Sing Paper Wrapped Chicken. Teck Sing competitor is just next door (at the left of the restaurant) called Bamboo Restaurant which also specialises in serving paper wrapped chicken. Years ago, Bamboo Restaurant's version was more popular. However over the years, the standard has dropped. 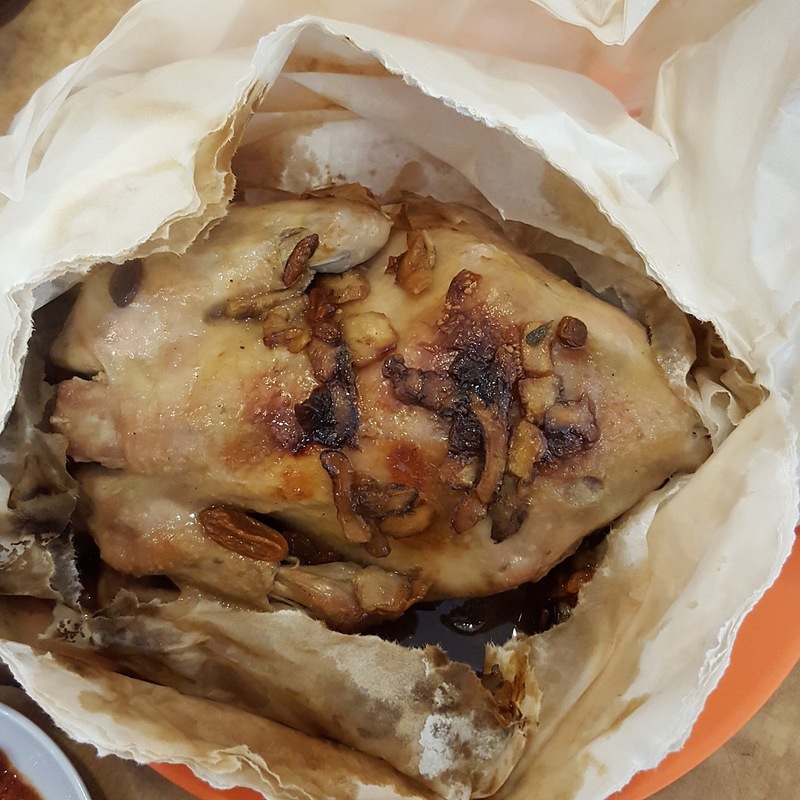 Currently, Teck Sing's paper wrapped chicken is more popular among the locals and Singaporeans. Teck Sing's signature Paper Wrapped Chicken 德星药材纸包鸡 aka Yao Cai Ji now cost RM 26. It used to cost just RM18 four years ago! The eatery uses kampung chicken which is wrapped in a few pieces of thick superior paper and baked for several hours with various Chinese herbs. The chicken was incredibly fresh, soft, tender and juicy. It was so fork tender; the flesh fell part from the bones easily. So delicious and delectable! One of the best Yao Cai Ji I have ever had. A must order! The Kang Kong with Sambal Chilli RM10 was very well executed. 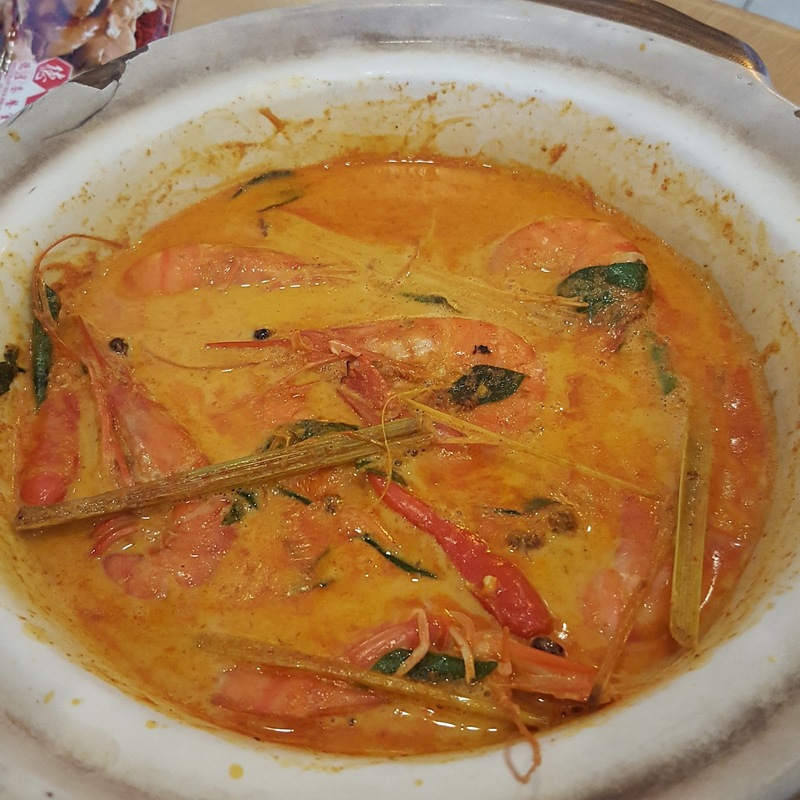 It was well-cooked and the Kang Kong was still crunchy. 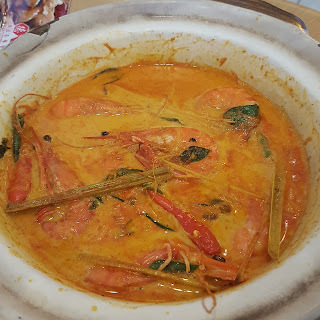 The Kang Kong with Sambal Chilli strangely was more sweet than spicy with the fragrance of garlic and shrimp. Despite that, this dish was so savoury and delicious that we polish it off within minutes. This is a common dish that is available at most eateries and yet Teck Sing has proven that their cooking technique is still one of the best. Another dish that we tried was the Curry Prawn in Indonesia Style 印尼虾 RM 30. 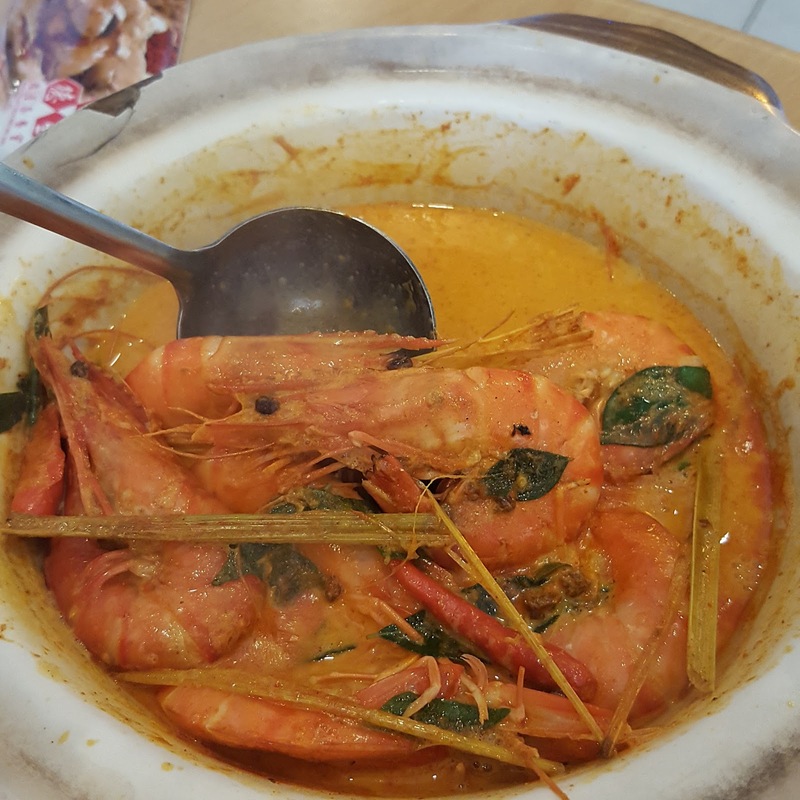 Cooked in a claypot, it arrived pipping hot with several huge prawns in curry broth! The prawns were fresh as they were easy to deshell. Moreover, the meat was firm, succulent and sweet. The curry broth was spicy, fragrant and milky. 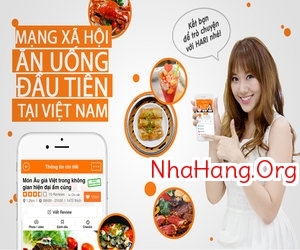 It is best accompanied with plain rice!